This post will hardly be an exhaustive view of all the options for flooring. I researched for so long to try and find the best fit while knowing that as much as I’m trying to follow a budget, I also will probably not likely change the flooring in any foreseeable future. 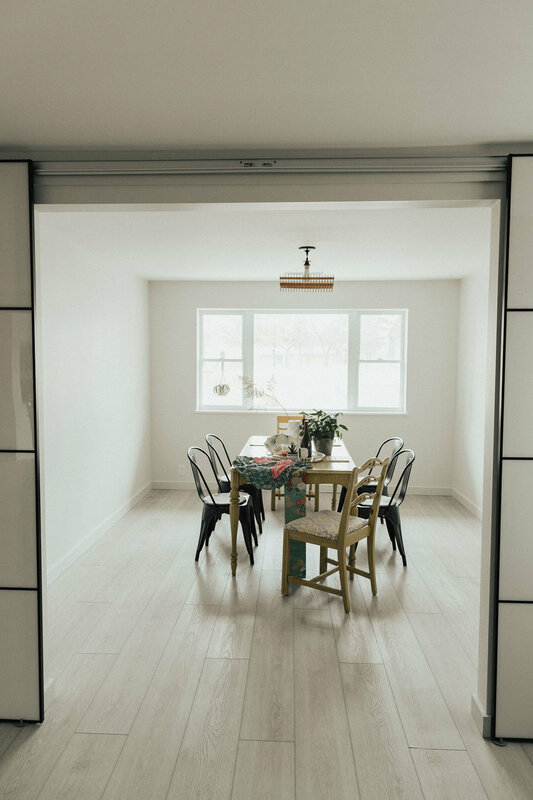 Some things like kitchen cabinets sound a little easier to change out later on (not easy, but easier) than to change the flooring in an entire house. And yes when I say entire house, that’s what I mean. 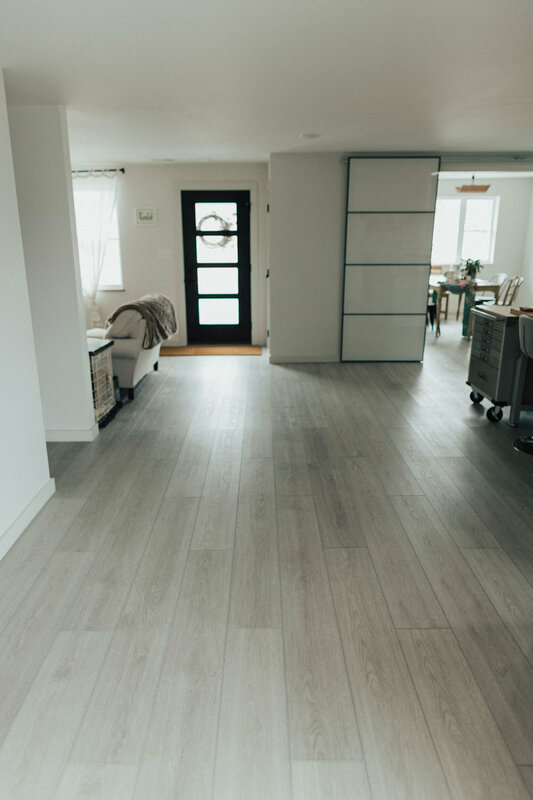 I found the various more diversity of flooring you choose in the house means more transition strips or more design changes and limitations to flexibility of flooring spaces. All in all, it was important to me to only have one flooring everywhere. My brother and sister-in-law just finished a remodel about a year before me and so I was blessed to learn from their flooring choices. I love their flooring! I learned it as coretec which is a LVT or LVP, which is waterproof since it’s made out of vinyl. But that means it may dent or scratch as well. I think if cost wasn’t a thought I would hired out laying underfloor heating and doing a hexagon tile and hardwood mix everywhere. However, cost was a factor. And also LVT is one of the easiest floors to diy laying it yourself. I had always had this thought of maybe trying to do a floor at least once in my life. 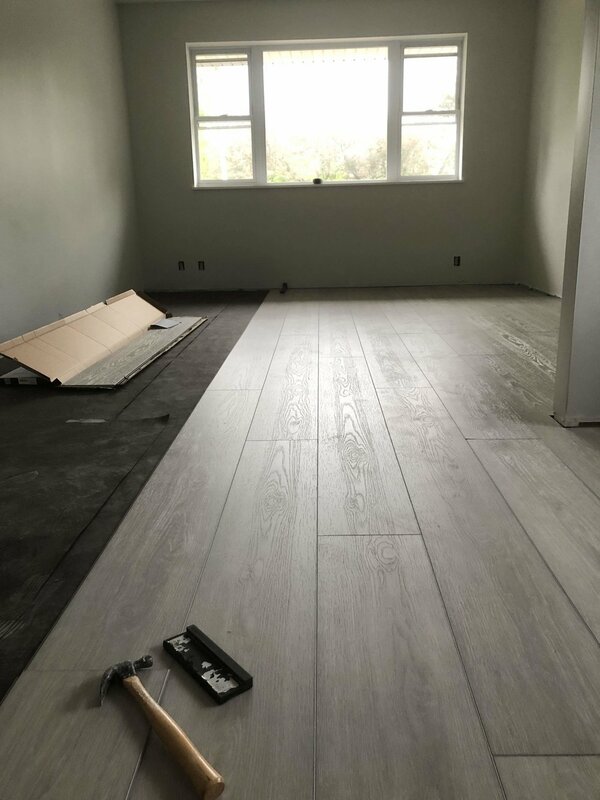 Other questions like dark or light, heavy grain or light grain, busy or more solid, flat or more textures, thickness of the wear layer, etc were delved into deeply in my time once I decided to go for this flooring. One problem, I couldn’t figure out how I could get the coretec flooring and then install it myself. This was one thing I learned frequently during the remodel. That most places that sell you a product will almost always insist that you have them install it for you. That was a drawback for me since I wanted to try it myself. So after some searching I found a site called flooret. There’s a prominent discussion about it vs coretec on houzz. They sell the flooring only and they offer to help connect you with an installer. You purchase samples and everything online which is shipped directly to your house. I like the process and it made sense to me. So a friend of mine helped decide how much sq. ft. I needed including waste and then once it came in showed me the first few planks. But that’s getting a little farther ahead. See there’s was another hiccup that I hadn’t realized. 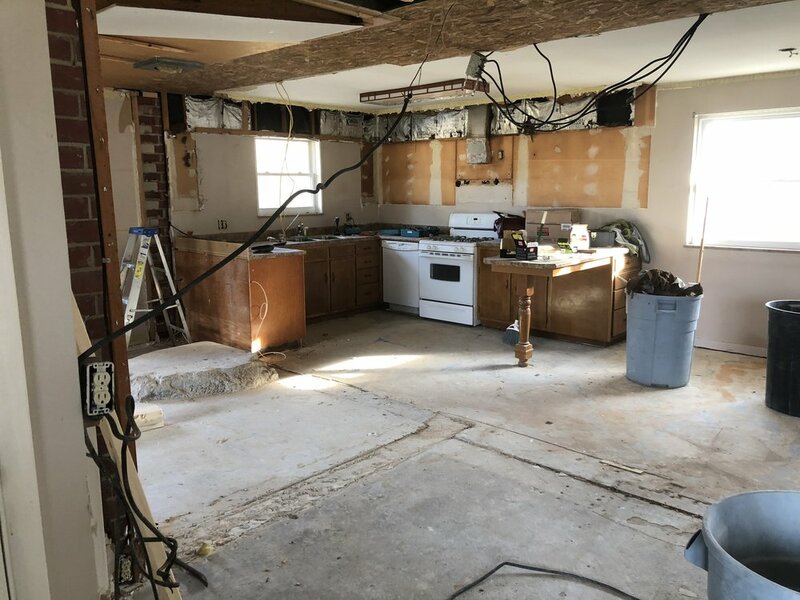 Since I had removed several walls in the kitchen area to make it more open (and awesome) a few of those walls were made out of block and had been laid before the foundation concrete. 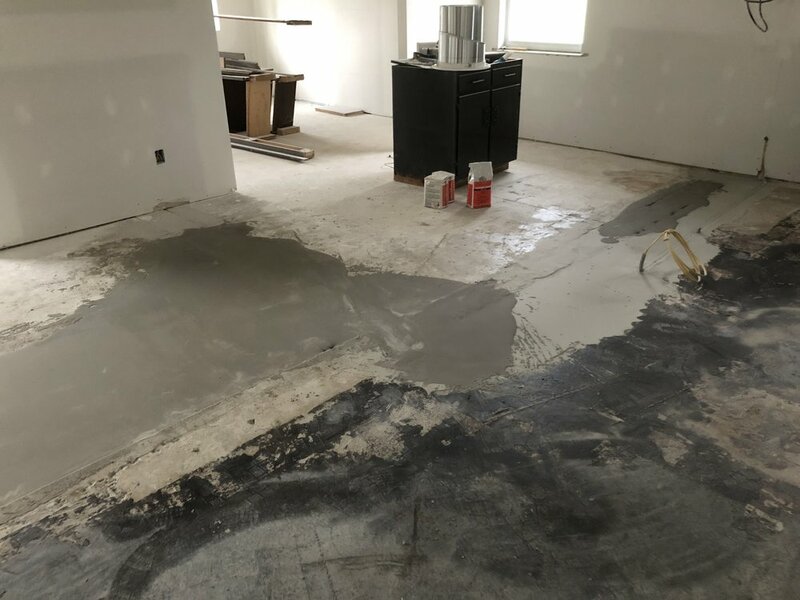 Which means that when we removed them it created the exact opposite of a perfectly level surface which is what any vinyl flooring needs before installing. So I had to find someone who was willing to do one thing, level my concrete subfloor with feather finish. Normally this would be something you’d pay extra and the flooring installer would take care of. Trying to find someone to do this one step in the process provided to be quite a challenge. But through some talking with friends and networking around I eventually was connected with a great guy who did a wonderful job for me. I’m so thankful! Summarizing, I went with Flooret planks (with a limestone core so I could do my longest run of 47ft without a transition strip) with a thin vapour barrier underneath (same stuff as what goes below roofing) after my subfloor was leveled with 400lb of leveling concrete and feather finish. So much self leveler had to happen to get it looking like this! He even was able to trench in an electric line so I could get electric in my island! He also had to grind out some high bits which is a painstaking task. my longest run: 47 feet with no needed transition strip, yeah! keep going until you get everywhere. beware of door jambs! talk to your trim guy before the doors were set! I should’ve done my flooring before the doors were set because I ended up having to undercut some new jambs only because I couldn’t click lock the flooring in place without more of an angled space. Learn from my experience. What a nice flooring company!